At 2:04 a.m., four minutes out of Chicago's Midway Airport, something—Civil Aeronautics Board investigators are trying to discover what it was—went seriously wrong. Pilot James Sanders, 40, veered north from his southwest heading as he fought for control of the Connie. In the Chicago suburb of Clarendon Hills, homeowners heard a sputtering of engines overhead, then a glass-shattering roar; for a moment, some thought that there had been a nuclear explosion at the famed Argonne National Laboratory near by. But the noise was the death of Flight 529, as it crunched into the earth and skidded in flame for half a mile across a field of corn and soybeans. There was no time to escape; the crew of five and all 73 passengers were burned to death, in the most costly single-plane disaster of U.S. commercial aviation history. During the climbout from Midway Airport, a bolt worked its way clear in the elevator boost system. This was followed immediately by full pressure to the up-elevator side of the actuator piston. The airplane pitched up violently and an it entered an accelerated stall. The pilot's immediate response to apply high forward pressure on the control column prevented successful shift of the elevator boost system to the manual position. The pilot lost control of the airplane. Oscillatory loads then caused the separation of a of the horizontal stabilizer to which the right verticalfin is attached. 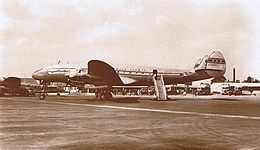 TWA Flight 529 was a Lockheed Constellation L-049 propliner, registration N86511, operating as a scheduled passenger service from Boston, Massachusetts to San Francisco, California. On September 1, 1961, at 02:05 CDT, the flight crashed shortly after takeoff from Midway Airport (ICAO: KMDW) in Chicago, killing all 73 passengers and 5 crew on board; it was at the time the deadliest single plane disaster in U.S. history. The accident was investigated by the Civil Aeronautics Board, which concluded its probable cause was the loss of a 5/16 inch bolt which fell out of the elevator control mechanism during the climb from Chicago, resulting in an abrupt pitch up followed by a stall and crash.